Mondays to Fridays they demand good, car-like comfort in the city, where heavy traffic proves the need for ultra-smooth automatic transmission, reasonable fuel economy and space. 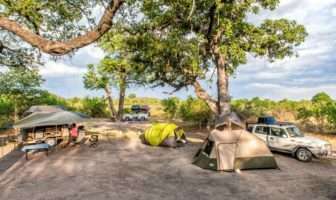 But come the weekend, it’s time to hitch up the caravan, pack the firewood and camping gear into the load bay, and get away from the humdrum of high-density living. 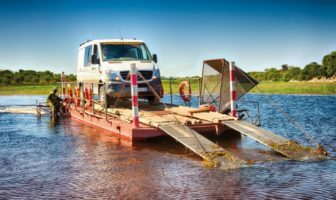 Having an easy tow to and from the destination is a priority. With 550 Nm of turbo-charged engine torque under this V6 Amarok’s bonnet, there is no need to drive in a way that demands concentration in coercing or extracting maximum engine performance. 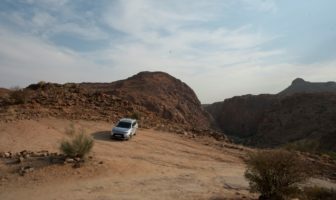 There is also no sitting on the edge of the driver’s seat in readiness of making early gear changes to overtake or get up the hill without slowing down to a snail’s pace and holding up traffic. With all this power plus 4-wheel traction, this is one of the most relaxing tows you will find today. Some 9 years ago, Volkswagen rewrote the bakkie manual when they entered the market with a relatively small engine, a 2-litre twin turbo Amarok. 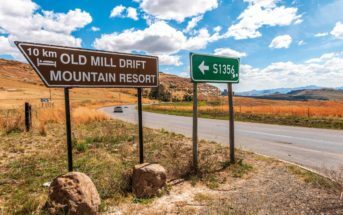 It was a brave move, considering this hotly contested big bakkie market segment was experiencing a demand for bigger and more powerful engines. Now VW has done it again by fitting a smooth-running 3-litre diesel car engine and 8-speed automatic into the Amarok. This turbo diesel engine is not new: It has seen service in Audi, Porsche and VW vehicles, not to forget the 4×4 Toureg. 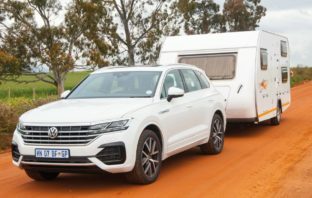 While turbos are effective in getting huge amounts of power out of smaller engines – particularly diesel engines – this bigger capacity turbo diesel engine achieves a response that is simply delightful, particularly when it comes to towing. 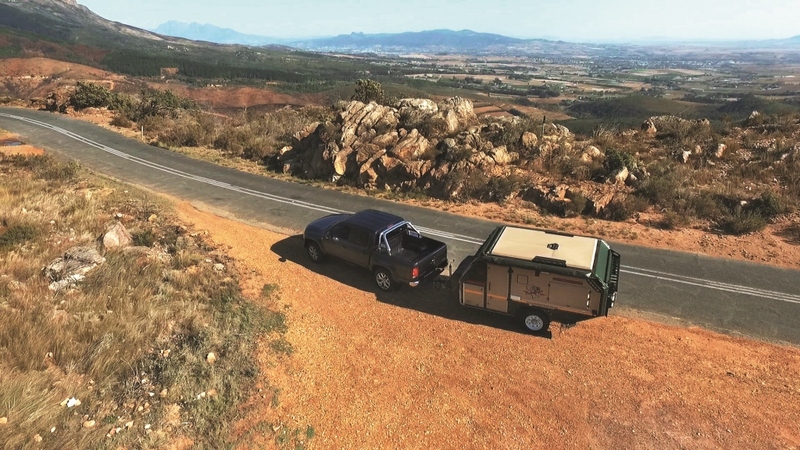 Put your foot down and you feel the difference: Maximum torque of 550Nm is delivered between 1500 and 2000rpm, which sets this engine at an ideal torque band for towing. When you need to overtake, you don’t have to wait for the vast expanses of clear road – put foot and don’t spare the horses, and it will accelerate from 80 to 100km/h in 5.38 seconds! 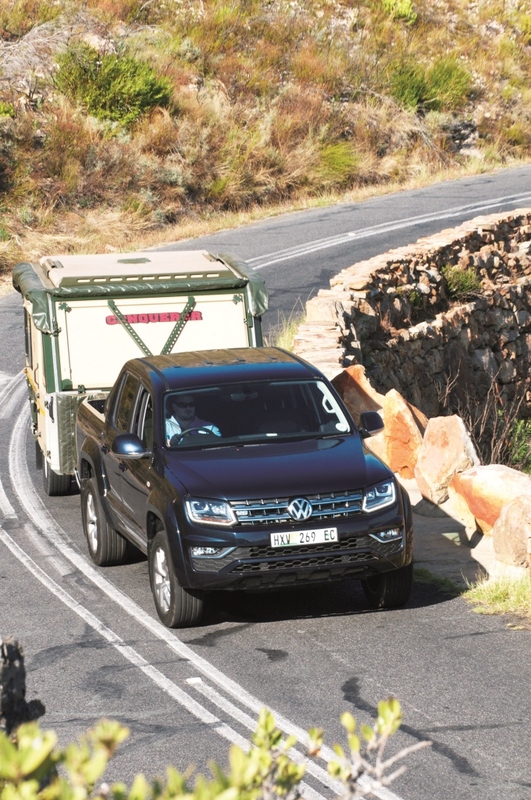 Some statistics: This model Amarok has a factory-recommended maximum braked towing capacity of 3 080kg. 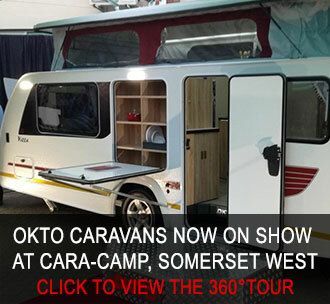 It also has a GVM of 3 080kg and a GCM of 6 000kg. 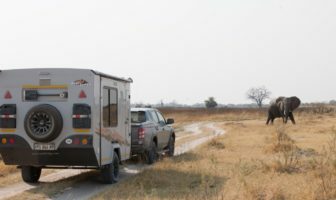 For those that don’t know, GCM includes whatever is loaded into or onto the back of the bakkie, the canopy, bulbar, plus the weight of the bakkie and the fully-loaded caravan or trailer. Cubic capacity does not stop with the Amarok’s 3-litre engine. The body is also wider than most bakkies, and this extra-wide wheelbase equals aboveaverage stability. Add other factors such as all-wheel drive, body length, and good steering, and what you get is above average traction, stability and straightline towing. We decided to take on the Cape’s magnificent (and almost forgotten) Bain’s Kloof Pass. It’s windy-windy (as in turns in the road) and sometimes even windy (as in the weather), as well as narrow in places, with magnificent stonework. As it was winter, the protea were magnificent. 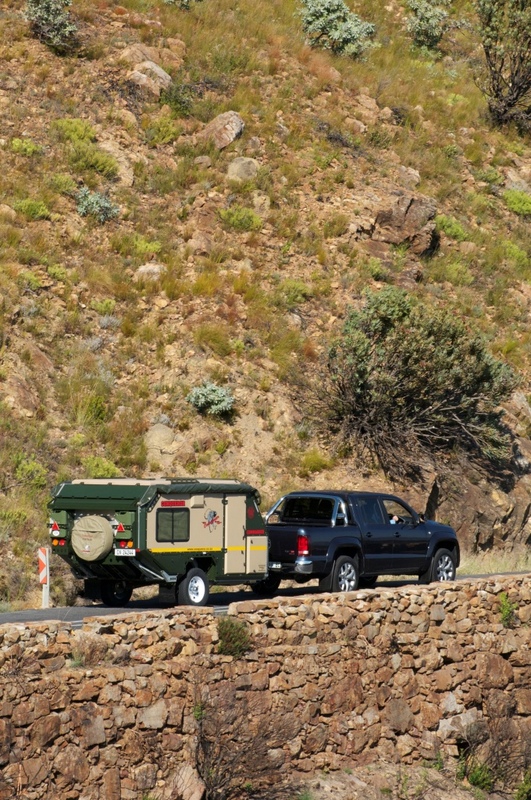 What we liked most while towing was the feeling of knowing the width of the caravan was close to that of the Amaroks. 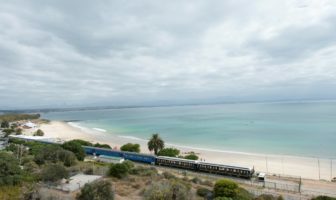 You had a good feel of available space on either side of the combination, of the line to take going into the tight corners and on encountering oncoming traffic. But it is that engine power, automatic transmission and steering that really makes this combination stand out, for no mountain road is too steep! 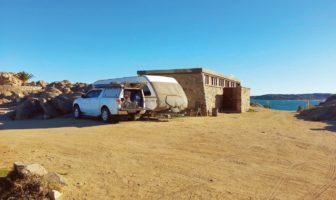 For those caravanners and campers who have forgotten Bain’s Kloof, that delightful caravan park in the centre of the pass called Tweede Toll is still in operation and a wonderful place to spend the weekend. Volkswagen have a winner here. 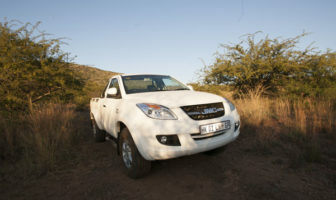 It’s by no means cheap, but you get what you pay for in that it’s probably the most comfortable bakkie on the market with car-like comfort. It also has the benefit of load ability; but, without doubt, the biggest attraction is the 550Nm of pulling power and 8-speed gearbox. Yes, please! 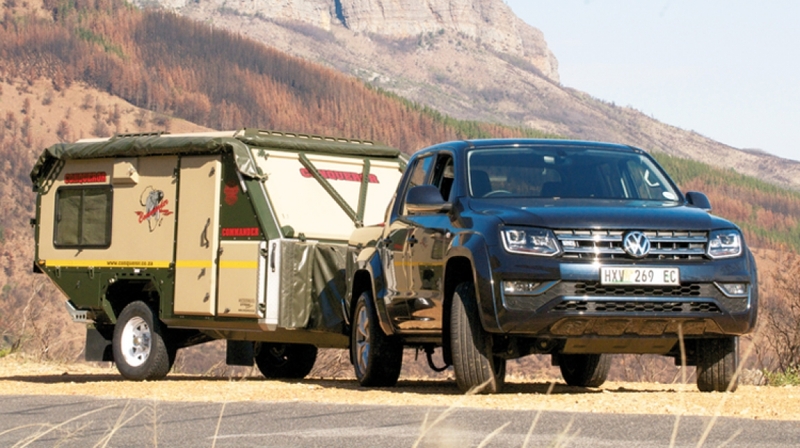 With the Amarok’s 4×4 ability, we looked back to an old favourite of ours, the Conqueror Commander. 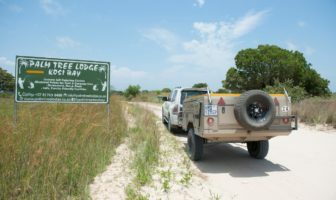 We have towed these caravans through the Mozambican bush on the other side of Kruger Park, also over Van Zyl’s Pass in Namibia. They have a pedigree of toughness that is hard to beat. In fact, this tough off-roader is designed to go wherever you dare to take it, and it boasts the signage “Military Tuff”. If you damage it, you can simply replace out-of-shape body parts with new ones. It’s all CNC cut and panels get riveted back. It even has a spare wheel carrier that contains an extra stub axle – because you never know how tough the travel is going to be in Africa! 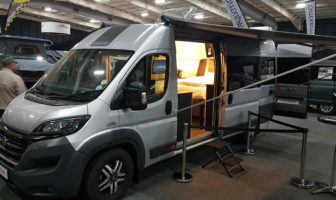 With a GVM of 1 500kg, it sleeps up to four people, two in a fold-out double bed and two in another queen size bed that can also be used as two single bunks. 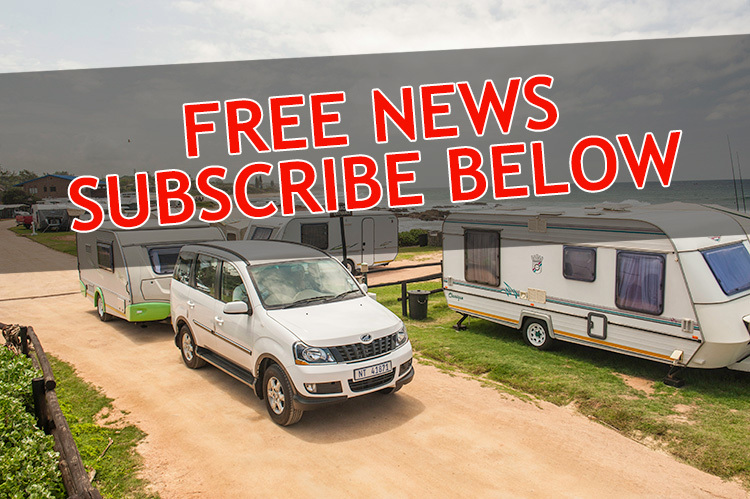 Unusual on a caravan is the galvanized chassis and red-painted, independent coil spring suspension, complete with Tough Dog shock absorbers and Al-Ko braking system. Its appeal is simply macho, off-road capability, and underscored by big, fat 245/70/16 allterrain tyres, heavy-duty mud flaps and high lift jacking points. 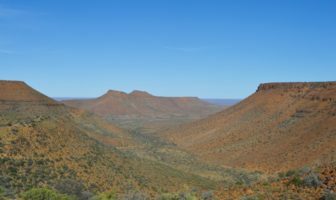 The Commander will climb over anything a 4×4 can, it will wade rivers, and travel endless corrugated roads. The spare wheel is carried high up on the back wall, between two 25-litre steel fuel jerry cans. 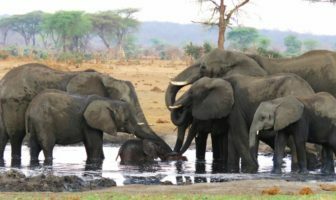 Fresh water is carried in a 150-litre onboard tank from where it is pumped via a pressurised system to the taps at the basin and the modular hot and cold shower. Its electrical system is comprised of dual deep cycle batteries and charger, and an intelligent 20A 14.5V power pack which in turn is powered by 12V charging via a 50 amp Anderson plug to the towing vehicle while in transit. In camp where 220V is available, there is a 15-amp power charging cord that can be connected to a portable 220V generator. The roof is like a clamshell in that it lifts on gas struts over the main door entry area only to increase headroom height when walking into the Commander. All the living is done outside – outside kitchen galley, outside shower/toilet, outside slide-out fridge/freezer. If need be, the fridge can be accessed from inside and the rear bed can be converted into a daytime dinette. 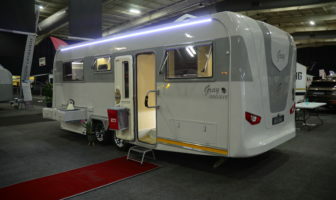 There are some 11 storage spaces with soft-cover curtain doors, a feature pioneered by Conqueror to reduce weight and to keep things contained when travelling continuously bad roads that would otherwise break conventional wooden doors and hinges. Oh, the “bad” news: We believe Conqueror production is already sold out months in advance, thanks to increased local and overseas demand. 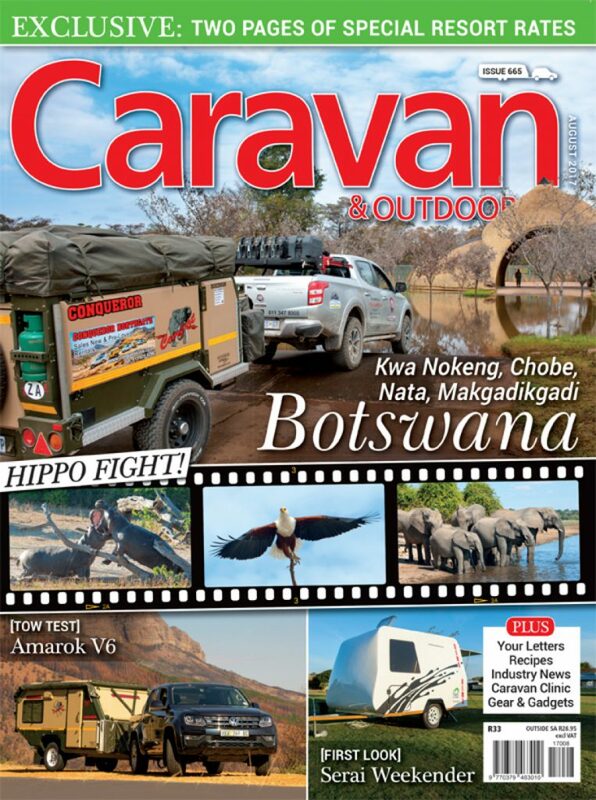 It has taken off well in Australia where it was voted a finalist in their offroad caravan category and it is also now available in the USA. It’s got to be good! 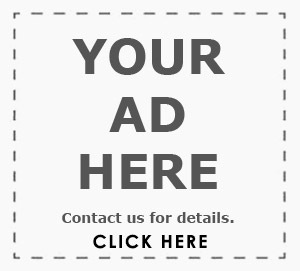 Do yourself a favour, and take a look sometime. 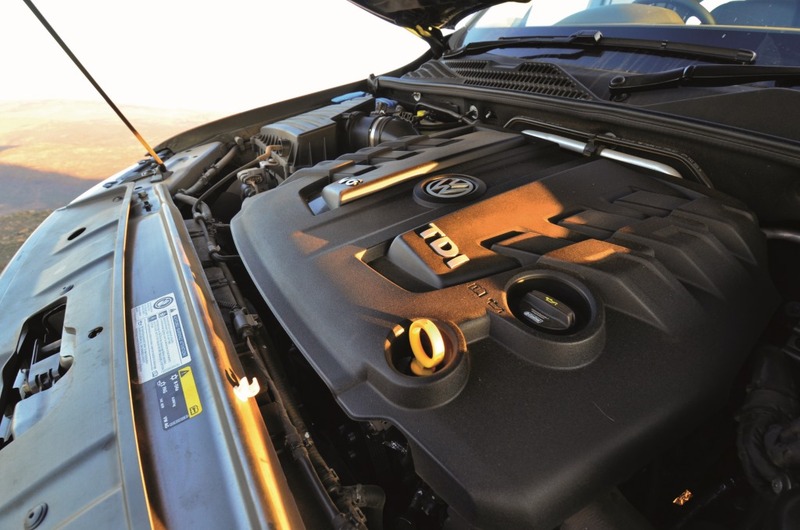 The prime reason for considering the V6 Amarok is for its engine performance. The second reason would be the 8-speed automatic followed by human comfort and then stability. It ticks all these boxes admirably.